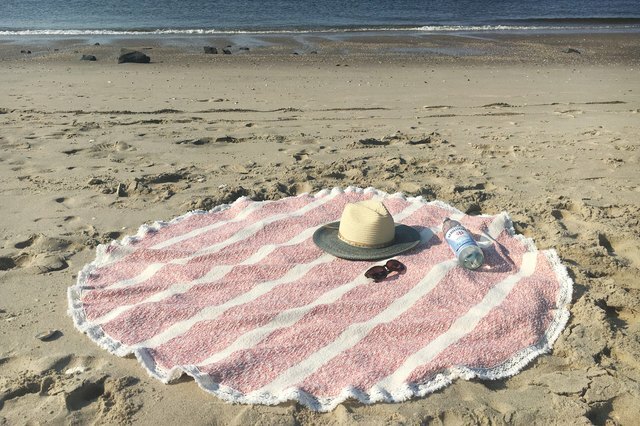 Round beach towels are the hottest new trend for beach-goers this summer. 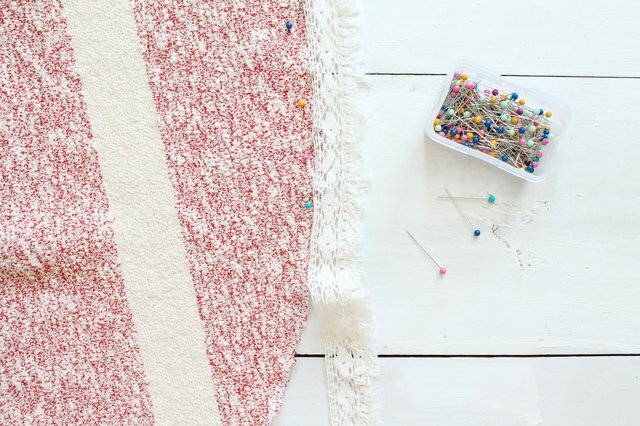 Make your own in under an hour with just a few yards of fabric and fringe trim — a perfect sewing project for beginners. 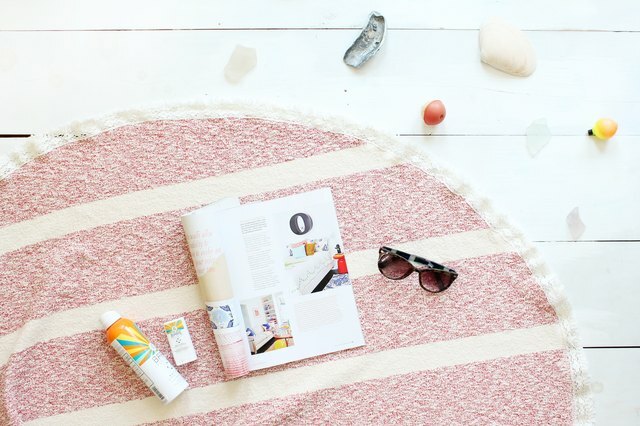 You'll be basking on the beach with your new round towel in no time! You can find terry cloth in the "knits" section of most fabric stores or online. You'll need a wide width of fabric to create a large enough circle for a full-sized towel, so be sure the fabric you've selected is wide enough before purchasing. Having trouble finding knit fabrics? 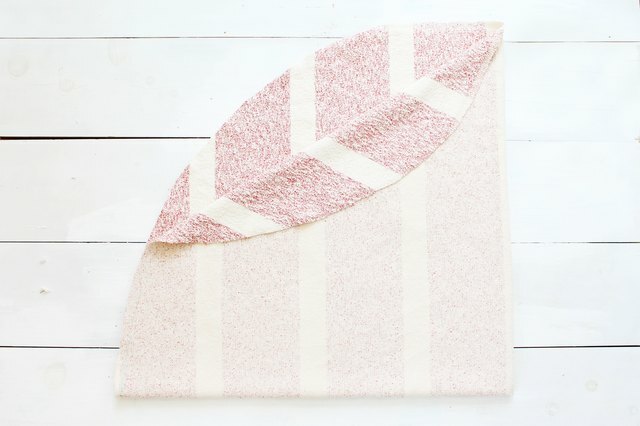 Try creating a turkish-style towel with a woven linen fabric instead! Begin by folding an ironed piece of terry cloth, a 62 inch x 62 inch square, into quarters (folded in half and then folded in half again). If you're working with a printed fabric, be sure the right side of the fabric is folded in and the wrong side is facing out. All of the raw edges should be aligned and all four layers should be smoothed out for precise cutting. To create a perfect circle the arc should be traced nearest to the open edges of the folded fabric. When unfolded you'll have a large circle, so ensure your fabric is facing the right direction before tracing and cutting. 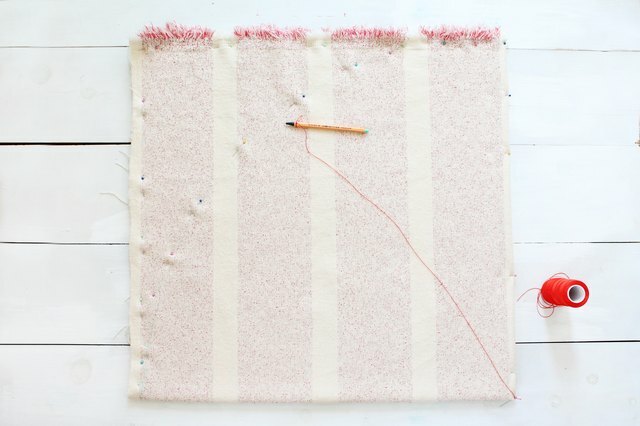 Create a makeshift compass by tying a piece of string to a piece of fabric chalk or marker. Hold one end on the corner of the folded edges and stretch the marker taut to the farthest top edge of the fabric. Trace a curved line from corner to corner (what will look like 1/4 of a circle) on the fabric and pin down along the traced line with straight pins to keep the fabric layers from shifting. Cut along the traced arc with sharp fabric scissors, cutting through all four layers of fabric. Remove the pins and unfold to reveal a perfectly shaped circle! 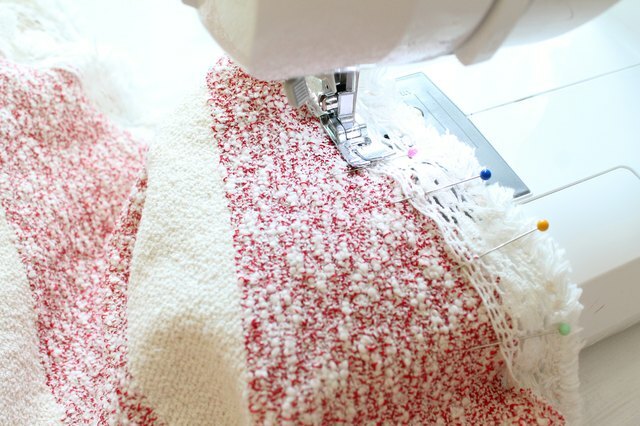 Keep the cut edge of the fabric from unraveling by threading your serger with coordinating thread and binding the edge of the towel. Be sure to test on a scrap piece of terry cloth first! This step will eliminate the need to sew a seam around the entire outside edge before adding trim. Don't have a serger? You can still easily complete this project with your sewing machine. Simply cut 1/4-inch notches into the fabric along the curved edge of the towel every 2 inches. Fold down a 1/2-inch seam and sew down with a zigzag stitch to finish the edge. Lie your fabric flat on your work surface with the right side facing up. Serge the raw edge of the trim to keep it from unraveling and place it on the towel's top edge with a 1/4-inch overlap. Pin the trim along the entire edge of the towel keeping the overlap consistent and the trim from buckling or pulling too tight. 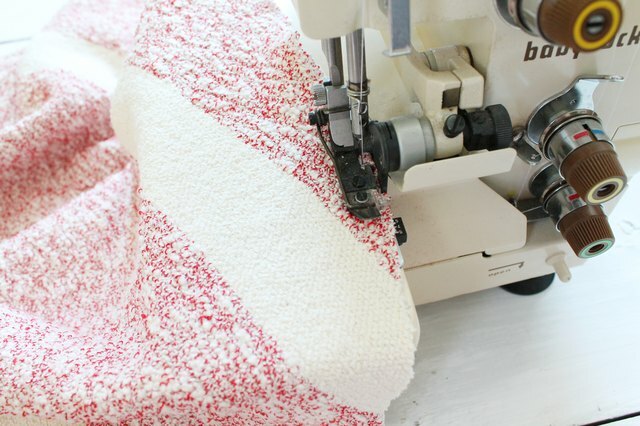 Secure the trim to the edge of the towel with a straight top-stitch and 2 1/2-inch stitch length on your sewing machine. Be sure to backstitch at the beginning of sewing down the trim to "knot" the thread. When you have stitched around the entire outside edge of the circle, stop 1 inch from the starting point, backstitch and remove the towel from the machine. Cut the remaining tail of the trim with 1/2-inch extra seam allowance and serge the raw edge to prevent fraying. Fold the end under and overlap over the existing trim to blend the ends. Pin the overlap in place and topstitch the remaining 1 inch of trim to the edge of the towel. Sew vertically down the width of the trim to join the two ends together and to keep the overlapped pieces from flapping up. Step 8: Finish and Enjoy! Trim away any loose threads with your scissors, wash on the gentle cycle and dry on low heat for a fresh and fluffy finish. If your terry cloth is white you might consider adding a pop of color to to the towel with fringe trim. Cotton trim is easy to dye and will add a beautiful and textural contrast to the edge of your towel! 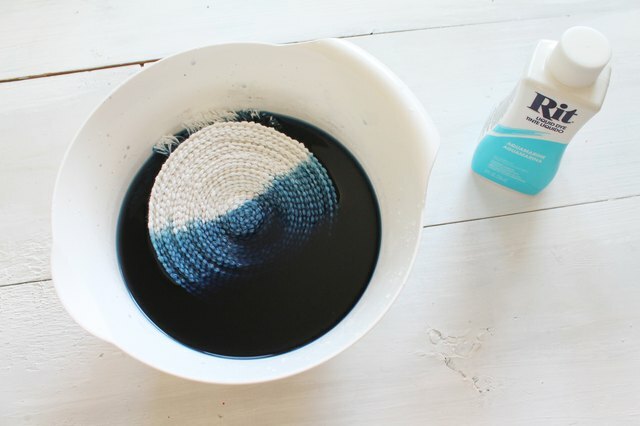 Simply mix a bottle of liquid dye according to the manufacturer's instructions, let the dye saturate the trim, and wash on a cold cycle! Dry your trim completely before sewing onto the edge of your towel to avoid color transfer. 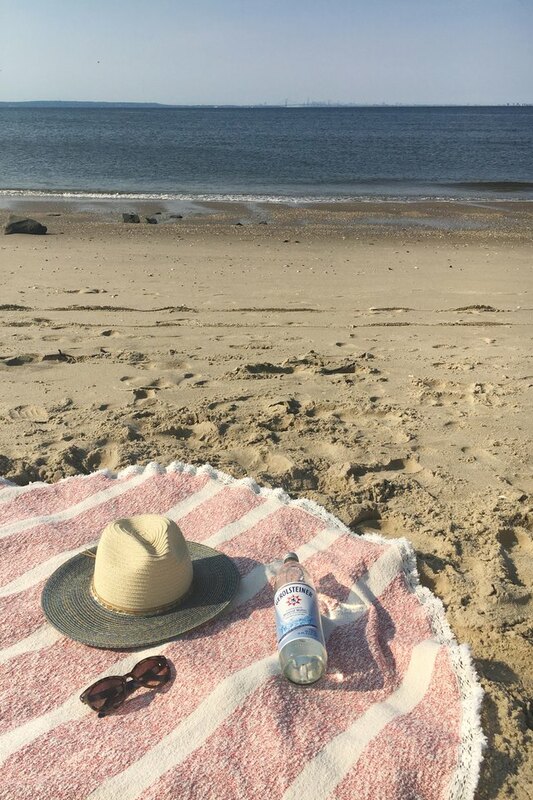 Take care not to leave this beautiful beach towel unattended — it'll be a hot commodity while you're sitting poolside!